The University of New Brunswick, Universite de Laval, Province of New Brunswick and Province of Quebec have banded together to study the impact winter ticks have on moose, thanks to funding from J.D. Irving, Limited (JDI). The five-year project began in the winter of 2017-18. Its focus is on understanding the significant role winter ticks play in New Brunswick and Quebec’s declining moose populations. Neighboring jurisdictions like southern Maine and New Hampshire have recorded mortality rates of up to 75 per cent of moose calves where winter tick populations are high. While winter ticks have always been present in New Brunswick, its warmer winters and shorter periods of snow cover have made conditions ideal for an upswing in winter tick populations. 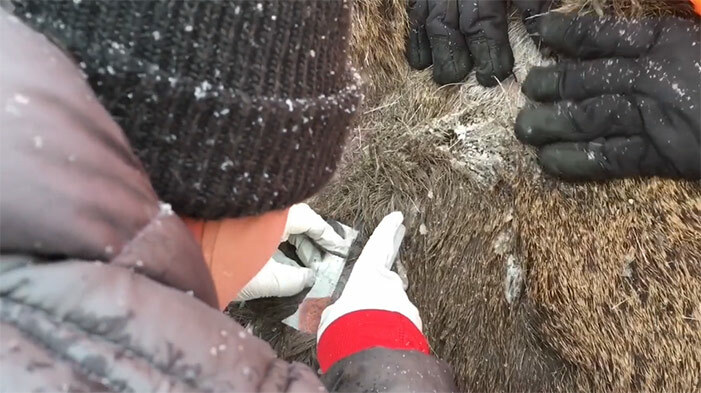 Wildlife veterinarian Dr. Michelle Oakley is working with the team to ensure each moose is properly looked after. She is known for her roles in National Geographic’s Yukon Vet, NBC’s Wilderness Vet, and was recently featured in the May 2018 issue of Oprah magazine. The study has three main components: it will first assess the health and physical condition of the moose, track population changes and their causes, and habitat assessment; it will research health and disease in winter ticks and how they interact with other moose parasites; and finally, a monitoring approach will be developed to help the public improve their knowledge of and ability to adapt to climate change. Researchers fitted calves with GPS collars in early winter, when ticks typically infest moose; the calves were tracked and checked in April, and their collars were removed. Up to 80,000 ticks were estimated to have been found on a single moose.